I did not want to sew these, but it was a must. In order for them to hang the way I wanted, nothing else was going to work. These are in the most visible room of our house, so I needed to step it up. Just a notch. So, I started by folding over one end 4” so there would be a substantial hem. 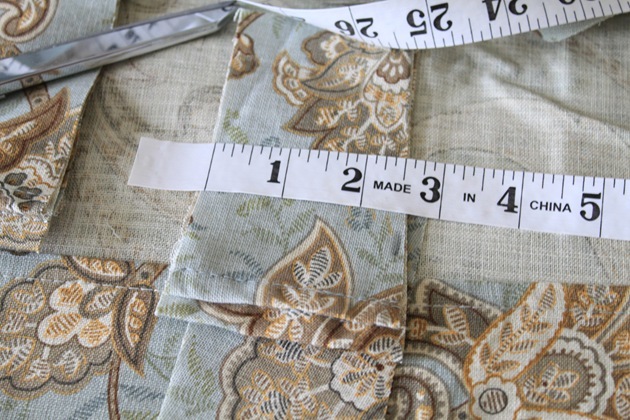 The width of each tablecloth was 60”, so I spent the next 3.26 hours figuring out how to space the tabs that I was going to use as the pleats. With a lot of counting on my fingers and using my phone calculator, I finally figured it out. I cut the strips from the extra fabric left over into 2 1/2” strips. I didn’t worry about hemming the tabs or making the lines perfectly straight. Who’s going to see them? With the width of the tabs plus the 5” in between them, it came out to 7.5”. That meant 8 tabs total. You with me here? ‘Cause I think I just confused myself. I guess I could have used some adhesive stripping or hemming glue, but all I did was a straight stitch across. It’s not like it took any time to do it, really, and I think it’s a cleaner look. I used the hem already in place as my guide. It took no time at all. Here’s what it looks like finished. Pretty raw, eh? Don’t worry. No one will see that part anyway. They will, however, see this part. Tablecloths. As curtains. I’m in love with how tailored they are. I’m all about the “no-sew” option, but with just a little more time spent on detail, I was able to get the look I was hoping for. I still have to hem the bottom and iron the far tablecloth panel, but that’ll have to wait until the weekend. Getting up at 5:30 now makes me a little more tired in the evenings. I’m very pleased with how pretty they are for less than I’d pay for ONE tablecloth. I’d say that’s still a pretty great deal. Those turned out amazing…and yes I do remember your plea to find another table cloth….glad you put that one to creative use. Gorgeous! Totally worth $60! They look beautiful. Those look awesome! I love the material and how well they hang. They look so lovely though! Worth every penny and minute spent on them. I am so going to use this idea. Often Joanns or Michaels have seasonal tablecloths on sale for 70% off after the season. You can buy them for about 5.00 each and make up great panels. Thanks for the inspiration. They are BEAUTIFUL! I love they way they hang with the tabs on the back…thanks for sharing! Love the pleated look at the top! A few more years and I’ll be out of toddlerhood at my house and my kids might be able to handle curtains not attached to the ring clips! They turned out gorgeous and are totally worth the $60! That was way too much math and calculating for me. But I totally love them! Careful though, the math dept might be looking for you to switch over! Lovely! I have tablecloth curtains too. Although I went the no sew route because our decor is very beachy and it works great for us! Love that print…LOVE IT! they are quite pretty. i hate it when you find one of something and have to go on ebay (and get gouged) to complete the set. but hey, i guess capitalism is at work! Great idea!! They look great. $60 is still a great deal, I can’t believe how much some curtains go for, for 1 panel.. ridiculous! Such beautiful fabric and there are hems to boot. Nice job. I really like the pleats, very custom looking. Great job…they look amazing and I can see “why” you wanted to find another table cloth…totally worth it. LOVE the pattern. They are gorgeous!! They look amazing. That is my favorite style, too…I buy the white ones from Target for $10 and add trim a lot. 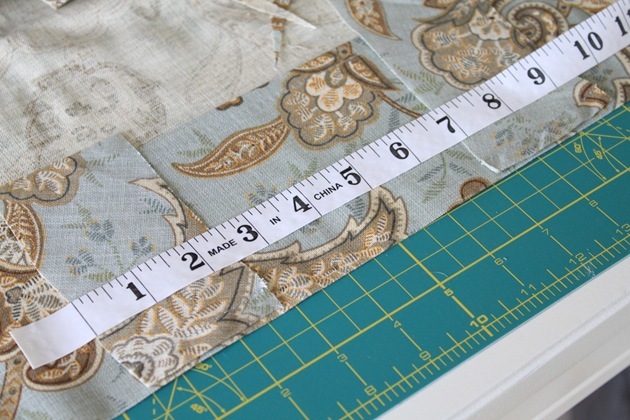 You could also use them as a “base” and sew or fabric glue any fabric on top if you are math challenged, like me! They turned out beautiful! I love the fabric. 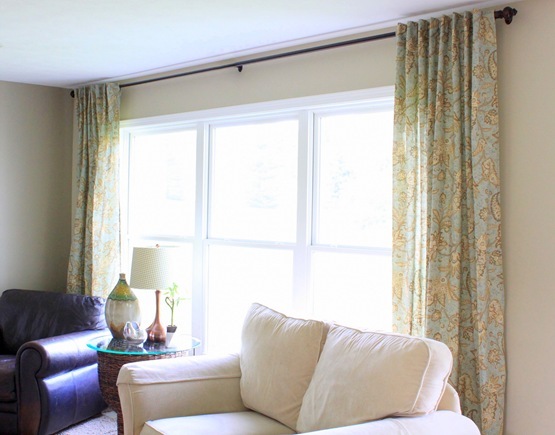 You did a nice job and more important the drapes hang really nice which means the fabric weight was spot on. I still might consider popping for the $48 tablecloth-you could make two pillows for the room and then purchase two other pillows in a complimentary fabric to make everything pop. I mean, if it doesn’t exist, sometimes you have to bite the bullet and spring for it. Just a thought. beautiful! Can you share a diagram of the top detail or a web link that explains it? I can’t quite tell what you are doing there with the pleats and the extra material. However I love the final product! I made this same tablecloth into curtains. Unfortunetly in the home we just sold! Loved them! I think it was worth it for curtains you love that turned out so beautifully! LOVE the fabric!!! Beautiful! I just did panels for my son’s room that were a pair of tablecloths found on clearance at Target! Hey, whatever works-they look FAB! Your drapes are gorgeous! I need something like that for my blah dining room. Thanks for the info! Wow, those came out fabulous! I really love the soft colours and pattern. Despite paying more than you wanted to, it really was a fantastic deal – they look far more expensive than that! I have toile tablecloths for drapes on my slider. I put pinch pleats in the top and didn’t have to hem them. I have been looking for something similar to what you have for my living room. I saw a tablecloth at Home Goods I loved but there was only one. I didn’t have the guts to ask people to shop for me like you! Guess I should have! yours look great! They look wonderful. I am truly amazed at anyone who sews. Great job! They look fantastic! I used shower curtains, so why not use table clothes? I’m going to keep my eyes peeled for pretty printed tableclothes now! brilliant idea and I love the results! 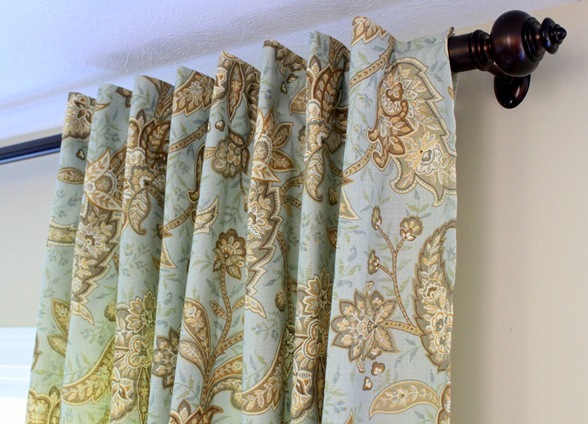 you did a wonderful job and they look fabulously stylish in your pretty home. 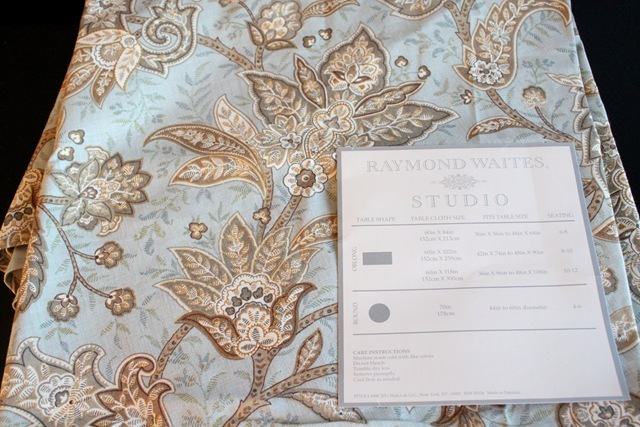 First- the fabric is beautiful. I love the colors, and they are marvelous in your room. Second- I love the way they hang! It looks like you have some crazy expensive drapery hardware under there making them hang like that. I am SO going to copy cat you in my family room! Third- brilliant to use a tablecloth. 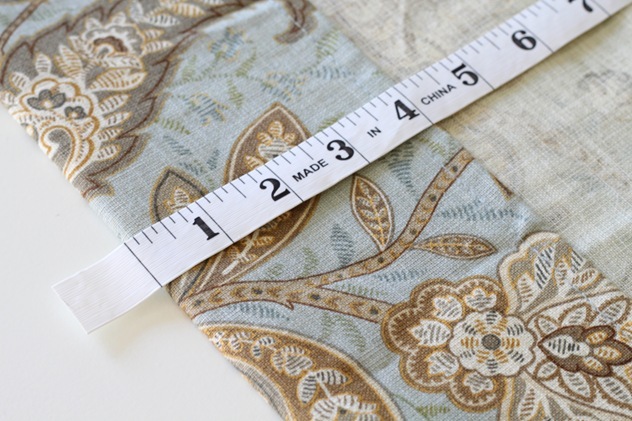 It’s a large piece of fabric, just about the right size for a curtain panel, and it’s already hemmed on all sides. Brilll-yant! They look fantastic. I’ve made curtains out of vintage sheets and I have to say they are so worth doing (for the money you save not for the stress it induces). I’m so impressed – great job & you worked hard to track down another table cloth. I love the fabric design too. It’s gorgeous! You really had an amazing skills making things like that. 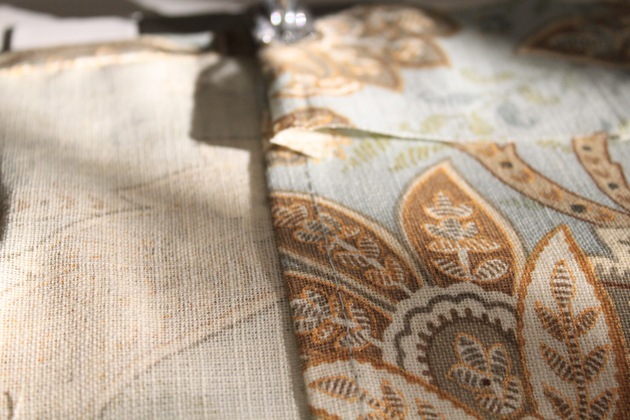 You’d pick the perfect textile of table cloth and designs for your house! Great! HOW GEORGOUS!!! 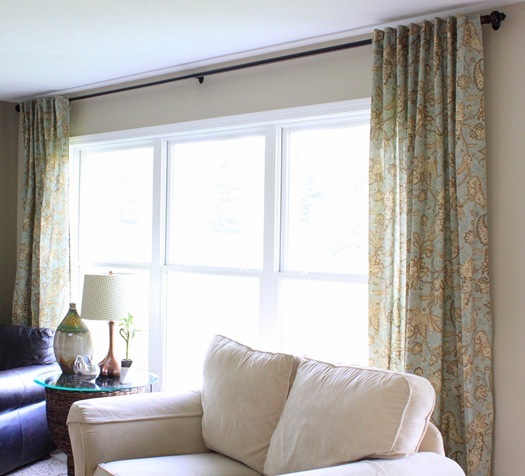 I have used tablecloths for curtains, just folded over the hem in front (maybe 4-5″—it was a lace tablecloth) and sewed a straight line making a pocket big enough for curtain rod to slip through. It made a “valance” on top and looks really nice. I absolutely love what you did with the tabs for a nice formal look. I will definitely be doing this in the future, but for not I am off to get black paint to paint my mismatched bedroom furniture black to match it all with the fireplace and flat screen TV… I love your method for that too! Thanks JustAGirl! I love how these turned out, Chris! 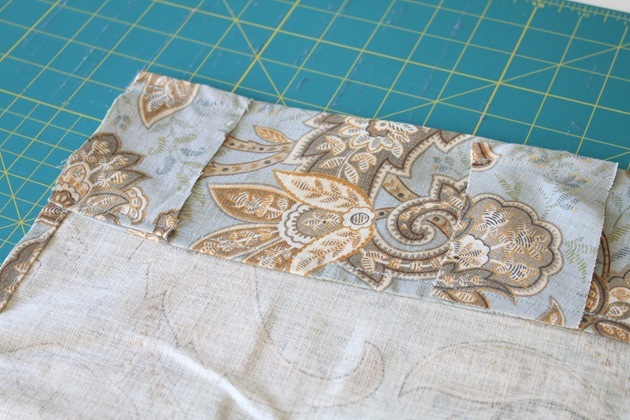 Remember my post about my table cloth fabric? You commented on how similar they were to yours. I love how tailored they look, you did a fabulous job! I always enjoy reading your blog! 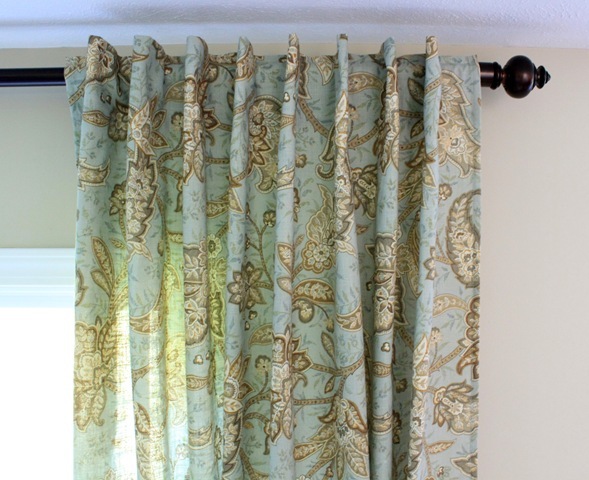 Omg so I looked up this today because I’m thinking about just making my own curtains because shopping for the perfect ones is just too time-consuming and stressful, and then I went to Marshall’s and I saw 2 packages of these there for $14 each! I was like omg what a coincidence, they are the exact same pattern! I was thinking if you thought you needed more panels for your windows, I could get them and mail them to you. I love your bloggy! Just discovered your blog from TDC….you are awesome!! Love your blog! Thank you so much, Lacey! I’m so glad you stopped by!! Very nice .. good job! Looks great! I am always having to convert long curtain panels into valences because I can’t find what I want, so I feel your pain! Great job! I’m a new crafter, so forgive my ignorance. Will making the tabs automatically allow you to position your curtains I’m that pleated look or did you have to manipulate them by doing something else.